US alternative asset manager, Blackstone, is expected to pump €50m into the Blanchardstown Centre over the next few years as part of a planned revamp of its ageing West Dublin shopping centre. The New York-based behemoth paid Green Property €950m for the centre last year in what ranked as one of the largest real estate deals in the State's history. Blackstone declined to comment on the mooted refurbishment bill. But sources familiar with the matter said the alternative asset manager, which hoovered up billions of euro worth of Irish commercial property after the financial crash, has set aside money to overhaul the 20-year old Blanchardstown Centre under a multi-year programme. Blackstone's additional investment in the shopping centre comes as hedge funds in the US place large bets against bricks-and-mortar retailers by shorting the shares of some of the nation's biggest shopping centre operators, including the Simon Property Group. The investor's strategy assumes the mass migration to online shopping will benefit internet titans like Amazon, and further undermine the growth prospects of traditional retailers. When Green Property sold Blanchardstown, founder Stephen Vernon, insisted he was not calling the top of the cycle. However the peak industry body for the retail sector recently declared the sector had entered a recession following a third consecutive quarter of declining sales - in stark contrast to the resurgent wider economy. In a report released this week, David Fitzsimons, the head of Retail Excellence Ireland, said: "Brexit concerns and eroding consumer sentiment makes for distressed trading ahead." Part of the problem, according to Lorraine Higgins, the organisation's spokeswoman, is the aggressive marketing of online shoppers in Ireland by UK companies hoping to capitalise on the fall in sterling. She claimed the UK's lower Vat rates of 20pc, versus 23 pc in Ireland, pose an added challenge. The industry's tough trading environment mirrors the bleak conditions in the US where bankruptcies for the first three months of 2017 have already eclipsed the number of closures recorded in 2016, according to a recent assessment by restructuring adviser, AlixPartners. Headwinds are also buffeting major brands in the UK, where Debenhams, in an effort to arrest falling profits, unveiled plans to close 11 warehouses whilst placing 10 stores under review. It is unclear whether the changes, disclosed at its half-year results earlier this month, will impact its Irish operations as the chain does not separate out earnings for its Irish arm. 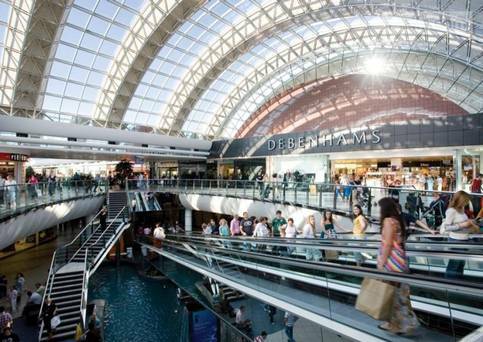 Blackstone counts Debenhams as one of its anchor tenants at Blanchardstown. Blackstone has forged a reputation for turning around struggling shopping centres. Occupancy rates and footfall at Blanchardstown are already high but retail sources claimed rent increases at the shopping centre were piling pressure on retailers and warn of store closures if the trend continues. Despite the protests, real estate agents remain bullish about the outlook with Savills predicting a 7-10 per cent upswing in rents for the sector in a report released at the end of December. But one senior industry source argued the dynamics will shift even further in the direction of online retailers if Amazon opts to open a warehouse south of the Border. The ecommerce heavyweight already has a distribution centre in Northern Ireland although there are predictions from some quarters, the company will establish a presence in the Republic. In a potentially prescient move Green Property now controls one of Ireland's largest logistics parks, located near Dublin airport and the M50 motorway. At the end of last year the listed landlord swooped on 16 acres of land adjacent to its existing holding at Horizon Logistics Park taking its land bank in the area to 264 acres.